We're open ... come on in! Remember when penny bubblegum included a tiny, wax paper comic? 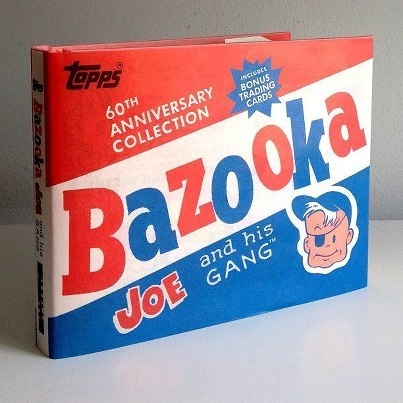 Bazooka Joe, Fleer Funnies, Dubble Bubble and Tommy Swell, were some of the pleasures of being a kid. Did you ever save the comics to send away for that 'Atomic Submarine'? Or did you simply collect them because they were too cool to throw out ... like Cracker Jack prizes, pop bottle caps, S&H Green Stamps and baseball cards. If you would like to know more about those Bubble Gum Comics, welcome to my site! Announcement! 4-21-07: I've been meaning to update this site but due to a new job in January I've been unable to at this time. Argh. Don't worry though, I'm still gathering new information and comics for later inclusion. Thanks! old NEWS! 5-15-06: Check out 2 brand new pages covering Topps Bazooka gum in the 1990s. old NEWS! 5-1-06: A new page has been added covering the most recent Bazooka bubble gum comics, the 2000s. old NEWS! 4-2-06: I've added yet another page. This covers Bazooka Joe bubblegum comics from the 1970s. old NEWS! 3-25-06: I've just added a new page covering the Bazooka Joe comics from the 1980s. I'm excited.